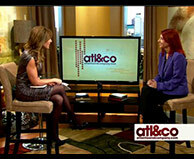 Abby is interviewed by Christine Pullara from Atlanta & Co. about her book and her tour. She also discusses some great free tools for job seekers. Abby talks to Diane Macedo about the "Total Career Makeover Contest" where she gave away a free makeover, an interview suit and job search advice to one man and one woman in the NYC area. 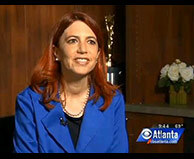 CBS Atlanta's Parker Wallace from Better Mornings Atlanta speaks with Abby about the importance of taking control of your career and developing a personalized career plan. Abby talks about skills gaps with the current job market, determining your career path early, and using free tools to help narrow your focus. Abby is interviewed on Good Morning Connecticut (WTNH Channel 8, the ABC affiliate) about ways to handle a lengthy job search and how to handle the stigma of being called "overqualified". Abby presents "Small Ripples Make Big Waves" at Tedx Rutgers. In the spirit of ideas worth spreading, TEDx is a program of local, self-organized events that bring people together to share a TED-like experience. At a TEDx event, TEDTalks video and live speakers combine to spark deep discussion and connection in a small group. Abby talks to Leslie Gold about how employers make it hard to find good workers and on why it's more important for employees to have the right boss than the right salary. Abby joins Bill Leff to talk about using "outside-the-box" techniques for your job search. Shelli Sonstein interviews Abby and John Fugazzie with Neighbors-helping-Neighbors about their respective missions to help job seekers. Abby talks to the great Joe Franklin about job seeking and the economy. KTU Cares with Cindy Vero interviews Abby and John Fugazzie with Neighbors-helping-Neighbors to talk about her Abby Across America tour, Career Wake-Up Calls, and job searching. Abby chats with Ricky Steele about her Abby Across America tour, the amazing people she has met along the way, and LinkedIn tips for everyone. Abby is interviewed by Bob Cudmore about about her book, "Absolutely Abby's 101 Job Search Secrets". She offers tips on finding your new job. Abby joins Chelsea Krost to discuss unique things to do to make you stand apart from your competition. Abby joins Bonnie D. Graham, aka Radio Red, to talk about how to maximize your online presence to positively affect your job search. She also asks fellow guest Actor Rick Lenz for some acting tips to use in an interview. Abby joins Charlie Lobosco and Eva Lewandowski for an episode of "Corporate Talk", the show with a unique sense of urgency and call for action in the workplace. Charlie and Eva learn some job search secrets and also learn more about the Abby Across America Job Search Success Tour. Abby makes a return visit to KTU Cares to discuss her Total Career Makeover Contest. While on the air, Abby reveals a bunch of tips for all levels of job seekers to Cindy Vero. Abby was interviewed by Charles James about her book, "Absolutely Abby's 101 Job Search Secrets". This segment of the program "Lehigh Valley Discourse" on the topic, The Job Search in Today's World, was originally broadcast on WDIY 88.1FM, Lehigh Valley Community Public Radio, on Thursday, June 16 2011, 6-7pm. It is the property of WDIY, the producing station, and made available here by permission of WDIY. Rod Colon and Abby chat about unique things that candidates can do to be noticed by hiring managers and what companies look for when they do a "background check”. Abby also shares her favorite job seeker networking success story. Abby is interviewed about "Absolutely Abby's 101 Job Search Secrets" on KTU Cares by Cindy Vero. Cindy interviews local celebrities and hometown heros who are giving back to their communities. KTU Cares shines the spotlight on those making a difference where they live. Abby is interviewed about "Absolutely Abby's 101 Job Search Secrets" by Valerie Smaldone, the 5-time Billboard Magazine Award winner, who is well known for her unprecedented success holding the #1 on air position in the New York radio market. Skip Mahaffey is nationally known as one of America's top Country Radio Air Personalities. His Award-Winning "Skip Mahaffey Morning Show" was a staple of Tampa Radio for over a decade. Now, he brings his show to the web via www.skipshow.com. Skip convinces Abby to give away her best job search secrets. Abby is interviewed about "Absolutely Abby's 101 Job Search Secrets" on WDVR-FM 97.1. Since 2004, Hilary Murray has hosted the Stepping Stones radio show where she interviews authors, celebrities, and leaders of charitable organizations about social issues. Margo Rose (@HRMargo) interviews Abby on "Compassionate HR", a show that introduces people in the business community that go above and beyond the call of duty to be of service to humankind. Interviewed by Daniel Lakstins on Dream Job Radio, which provides weekly expert advice from the top career coaches and consultants nationwide. Abby offers secrets to job seekers that typical recruiters just won't tell them. Tom Dezell interviews Abby about how to answer the "weakness question", the importance of being truthful on your resume and why headhunters are helpful to your search. Abby answers questions about the biggest mistakes that job seekers commonly make, the importance of a cover letter and how to use social media to get hired. Armin Brott, a.k.a "Mr. Dad" interviews Abby about "Success Tips for Teen Job Seekers"
Abby was a guest for Job1usa.com on WTOD Radio Station in Toledo, OH. The topic "Jobs For Candidates Over 50" continues to be relevant today. Rated as one of the top 100 influential people online according to Fast Company Magazine. The University of Rochester won a Bronze Award for the Absolutely Abby's Job Search Success Teleseminar Series. The Award was in the Alumni Relations Programming Category in the CASE District II Accolades Awards Program. Abby is named as one of "The Monster 11 for 2011: Career Experts Who Can Help Your Job Search"
Abby is named as one of the "Top 100 Twitter Accounts Job Seekers MUST Follow: 2013" by youtern.com because she is "A genuine soul and teacher – always positive." AbsolutelyAbby.com is selected to be listed on the Department of Labor's website as a top rated site for their "Tool for America's Job Seekers Challenge"
Abby is quoted in an article about local neighborhood job seekers helping other job seekers. Abby reviews the importance of the right keywords on your resume. Abby and other recruiters weigh in with strategies on how to fill a job that nobody wants. Abby says that it's about looking in the right place as well as looking for the right person. This front page article discusses Abby's event at the Kokomo, IN Business & Professional Exchange to help Kokomo job seekers. Abby's tour is mentioned and she is quoted in an article about local neighborhood job seekers helping other job seekers. Abby comments on thank you notes amidst a discussion about sending them via snail mail or e-mail. A thank-you note is a chance to remind the hiring manager how ideal your background is for the position. If you think of an interview as your commercial, your thank-you note is the re-run. Rochester welcomes Abby who delivers a workshop on job search success. Abby is invited to Dinosaur Barbeque in Troy NY to deliver a workshop on job search success. A local Rochester college welcomes Abby who delivers a workshop on LinkedIn. In "Impressive Job Candidate Qualities", Abby discusses the importance of candidates exuding passion for the company, the industry, and the specific job opening they are applying for. Passion is the ticket to a second round of interviews. Abby heads to Brevard, FL to speak about "Maximizing your Potential with LinkedIn". Neighbors-helping-Neighbors is expanding and Abby helps to find the leaders for the expansion. Abby reminds recent grads not to act entitled when searching for their first job. Scott Egelberg interviews Abby about her upcoming speaking event in an article entitled, "Is Being Overqualified a Curse? Absolutely Abby' Says Absolutely Not". Abby is interviewed by a reporter from LA Weekly about how college students should choose the best degree to pursue. Abby recommends that you consider the profession you are going to be most interested in once you graduate in order to determine the best degree. In "Here's the drill for using social media to get hired", Abby provides insights on how to stand out from the crowd using social media and other non-technical but innovative techniques. In "How To Craft An Attractive Résumé", Abby recommends that you focus on your accomplishments, incorporate keywords, highlight your volunteer activities, and increase your visibility on LinkedIn. In an article entitled "Hot Jobs 2010", Abby offers two pieces of advice on how to think outside this world. Urban Male Magazine is a Canadian mens fashion and lifestyle magazine, similar to Maxim in the US, with an average circulation of 120,000. Abby is chosen by The Daily News to provide advice to a local job seeker on her search during their "Hire Me" program. A creative job search tip that Abby suggested to a client who landed the job. Abby's opinions about establishing relationships with headhunters. An article that highlights Abby's success with Linkedin as a Consultant searching for new opportunities. Abby's comments about the financial advantages of owning a home business. A local reporter attending the Bucks County Job Fair wrote this article and claimed "I heard quite a few of the speakers, and in my opinion, you were the best! Concise, to the point, useful info everyone appreciated." Abby offers advice on using social media to hunt for jobs at a local venue. Abby is interviewed by her alma mater about her success as an author, entrepreneur and career advisor. Abby talks about why jobseekers are overlooked and how to raise the chances of attracting the attention of recruiters. Abby goes over the right, and wrong, questions to ask at an interview in the article, "10 Job Interview Questions You Should Never Ask". Abby weighs in on the best and worst questions to ask at your job interview. In "5 Ways to Give Your Resume a Makeover", Abby talks about the importance of using the right keywords in your resume. Abby reveals that although most people believe recruiters use social media to see what you look like, it's really about what you sound like. In the article "Four Things That Can Send Your Resume into the Trash", Abby offers her opinions to Monster on resume formatting and gaps. In the article, "5 Easy Ways to Win Recruiters' Hearts and Minds", Abby tells you how to maximize your LinkedIn profile to make it easy for recruiters to find you. Abby reveals how to crack the code of online applications so that you get noticed. Abby speaks with DICE about how decisions are made about hiring IT candidates. Successful candidates usually satisfy only about 75 percent of the technical requirements. Companies hire the least risky candidate with a great attitude and passion for technology. In an article called, “Recent Grads: 19 Great Tips for Your First Month at a New Job”, Abby suggests that you Buy a box of Dunkin Munchkins for your desk. This less than $10 investment will win you lots of new friends who 'come over to meet you. Abby shares a story of a job seeker who used a quirky method to get his foot in the door of a company. Abby reveals the secret to using keywords in your resume in "5 ways to give your resume a makeover"
Abby and her peers offer a variety of tips about what you can do after the interview to be sure that they don't forget about you. Abby shares her advice on what you should disclose about a negative work history in a job interview or application. Abby weighs in on being dependable and job seeking. Abby provides insight about reasons why you may not want to work for a company. Abby discusses college majors, the benefits of internships and networking. Will unusual job hunting tactics work for you? Abby tells a story about how a ping pong paddle helped a job seeker land an interview with her. Abby reminds job seekers that volunteering can help you stay active and engaged. It is a great way to gain new skills to add to your resume or to refresh skills that you haven't used for a while. You will also develop a new network who may be able to help you. Abby talks about how to handle your first days of working for a new company. Abby talks about the importance of asking the right questions at your interview in 'the article "10 Interview Questions You Should Never Ask (and 5 You Always Should)". Abby adds some creative networking tips to an article entitled, "In Through the Side Door". Abby and her peers offer unique ideas on how to get noticed by hiring managers and what not to do. Abby and her peers shed some light on "Weird and Wacky Things Actually Written On Resumes"
Abby offers a tip about a job seeker who went way outside the box and landed in the job of his dreams. In "A recruiter tells you what recruiters can't tell you", Abby provides pointers about working with external recruiters or headhunters. She stresses the importance of confidence and passion but also discusses the value of searching on your own to supplement a recruiter's efforts. Abby offers an effective tip on how to boost employee morale without increasing salaries. For little to no cost employers can implement programs that make their employees smile. In "A recruiter's advice for the job interview", Abby provides pointers for job-seekers on how to make the interview work to their best advantage, including knowing and articulating your accomplishments, demonstrating your passion, and asking intelligent questions. Abby joins a panel discussion and shares her opinions on networking with your boss online. Abby contributes to an article about pre-employment assessments as a factor in the hiring process. Abby shares some techniques for baby boomers who are competing for the same job as Generation Y.
Abby shares tips about how to make the best use of the time between a job offer and your first day on the job. Abby provides tips on working during your first three years out of college. An article about making an impression as a young professional when you're one of the youngest managers or executives in your office. Abby and the other panelists offer tips to help you command more of a presence. Abby and other staffing professionals offer "Tales of Bizarre Applicant Behavior"
Article titled "How Can My Resume Stand Out?" which includes several insights from Abby and other panelists. Article on "How to Write a Great Cover Letter" which includes several insights from Abby on how to stand out from the crowd. Abby provides tips on "Why recruiters are rejecting your resume" along with several other recruiters.